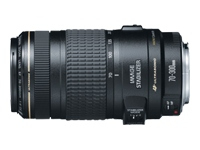 The powerful yet reasonably priced EF 70-300mm f/4-5.6 IS USM will appeal to nature and sports photographers looking to achieve sharper images when shooting handheld. Focal length translates to approx. 112-480mm equivalent in 35mm film format when fitted to cameras with APS-C size sensors. 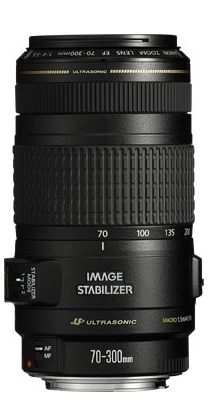 The EF 70-300mm f/4-5.6 IS USM features Canon's 3-stop Image Stabilizer (IS). Ideal for handheld photography, Canon’s Image Stabilizer allows photographers to use shutter speeds up to 3-stops slower with no perceptible increase in image blur. For stabilized panning, IS Mode 2 only corrects for unwanted vertical shake by switching off IS in the horizontal direction. IS is ideal for low light conditions, fast paced scenes and for shooting from moving vehicles. IS switches off automatically when the camera is mounted on a tripod. A UD (ultra-low dispersion) glass lens element corrects chromatic aberration to achieve high resolution and contrast throughout the zoom range without colour fringing on subject outlines. Only lead free glass is used in the lens construction. Optimised Super Spectra lens coatings and lens element shaping suppress flare and ghosting - more prone to occur with digital cameras due to reflection off the image sensor. Coatings also help achieve true colour balance and sharp high contrast images. A circular barrel aperture helps to create an attractive, even background blur when isolating a subject at large apertures. The lens's micro USM motor uses ultra-sonic frequency vibrations to drive rapid auto-focus with near-silent operation. Good holding torque ensures there is no overshoot. A high speed CPU and optimised AF algorithm contribute to AF speed literally faster than the human eye. Accessories include a lens hood (ET-65B) and a soft case (LP1222).